Zombies seem to be all the rage these days. From video games like the mega-popular Plants Vs. Zombies to the newest iteration of the card game Munchkin Zombies, we can’t get enough of these brain eating foes. 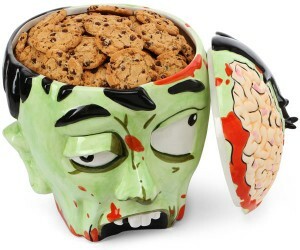 If you are a fan of the horror genre, or just happen to like zombie themed stuff, this cookie jar is for you. If zombies had the ability to do anything but mill around aimlessly looking for brains, I am sure they would want a cookie jar of their very own. As you can see from the pictures, this zombie’s head has a pretty big void to fill. You will need a ton of cookies, Halloween candy, or some other material to get it filled up. At the very least it should remind you that you can’t eat too many cookies or the zombies will be able to run you down. No one wants that, am I right? It would also make a great candy jar for the holidays. Would the local kids be willing to scoop out Snickers from inside a zombie’s skull cavity? My guess would be yes, but it would still be fun to watch them hesitate. The price of the jar is about what you would expect to pay as well given the thing’s size and detail. It comes in at $39.99 . Seems worth the price of admission to me. Ff you are in the mood to pick up some other scary pieces, might I suggest this Child’s Play Chucky Head Knocker. There was always something particualrly creepy about a murderous doll, and now you can capture that horror in a new form! Alternatively, maybe you want a way to keep in shape for the zombie apocalypose, or just to let out some stress. Burning calories is fun and easy with the Duel Combat set. Hand to hand combat skills will be very important when the zombies come. Just something to keep in mind.